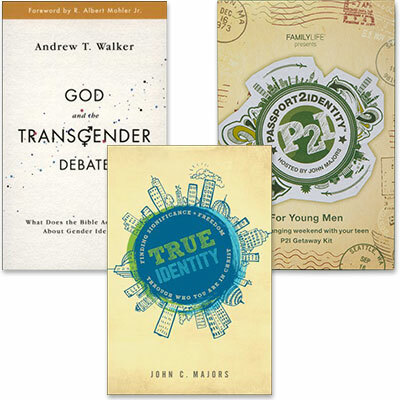 Purchase the two books God and the Transgender Debate and True Identity along with the Passport2Identity for Young Men or for Young Women at a special savings. God and the Transgender Debate: What does the Bible actually say about gender identity? Teens' Guide to Identity from FamilyLife - All teens wrestle with the question "Who am I?" and wonder, What makes me special? Though these questions linger for life, they are most intense in the teen years, where confusion, awkwardness, and a desperate grab for identity reign. So how does a young person answer these critical questions? Where do young men and women find their significance, worth, and value? True Identity is perfect for parents and youth workers to give to the teenagers (14-16) in their lives to help them in their journey. Drawing on experiences and wisdom from a wide array of experts, the book provides compassionate answers to help teens discover who they really are, emphasizing their identity in Christ above all other ways our culture defines them. As the book walks teens through the steps to make their faith their own, it highlights healthy independence and God-honoring relationships. The curriculum for Passport2Identity launched in April 2016, and True Identity is its trade book companion. Prepare your teen for life, no expertise required. Passport2Identity helps you do more than just survive the teen years. It gives you the materials you need to prepare your teen for adulthood during a weekend getaway. All you have to do is plan the time and location. We’ll provide you (or another trusted adult) with the tools and talking points to help your teen transition to independence through dependence on Christ.